Buckeye Valley’s Trent Davies (5) looks for running room during the second half of Friday’s MOAC showdown against visiting Ontario. 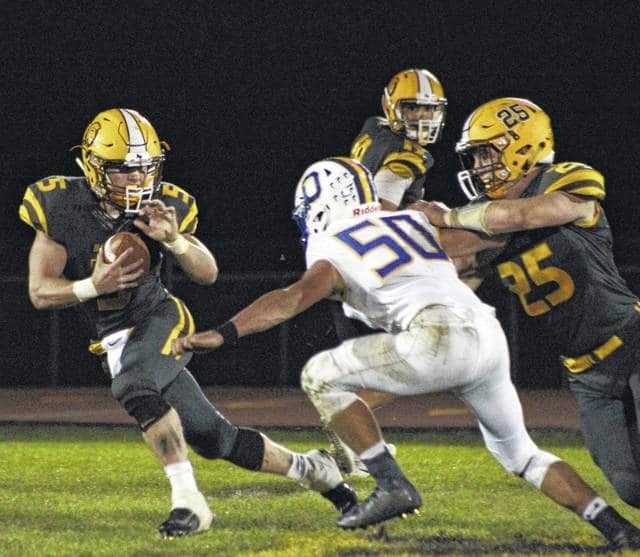 Buckeye Valley’s Trent Davies scored four touchdowns, including three in the second half to bring the Barons back in a 34-20 win over Ontario Friday night in Delaware. Davies had two rushing touchdowns, a receiving touchdown and a kickoff return for a touchdown to lead BV to a MOAC win. It looked bleak in the third quarter, though. Ontario’s Lyle Scott recovered Spencer Hall’s kickoff to no man’s land at BV’s 23 to open the second half. Quarterback Cameron Todd turned it into a touchdown on a 7-yard scramble, diving for the left pylon to give Ontario a 14-13 edge with 8:38 left in the third quarter. Todd’s touchdown pass to Scott pushed the lead to six after a missed extra point with 3:58 remaining in the frame. That’s when Davies took over. He returned the ensuing kickoff back for the tying touchdown and followed with touchdown runs of 1- and 54-yards as BV pulled away. “I just read holes and hit them – got my speed going and I was off,” Davies said. His 1-yard run was set up by Ed Reely’s fumble recovery and gave the Barons the lead with 11:25 left in the game. Davies busted free right up the middle on a 54-yard touchdown to put the game out of reach for BV (4-2, 2-1). BV Quarterback Grant Owens got the offense going with two touchdown passes in the second quarter. Owens went 7-for-7 for 59 yards, completing four of those passes to Joey Verdes, including a 30-yard fade to set up the Barons’ first score. “We were going to run the ball a lot coming in, but then we switched up the game plan and started passing a lot and it was working for us,” Verdes said. Owens capped the drive with a 3-yard touchdown pass to Teren Wycoff with 6:26 left in the half. He turned a negative into a positive on BV’s next drive. He was sacked by Ontario linebacker Noah Creed for a 10-yard loss on the first play. Then, Davies took an Owens screen pass and wove through blocks and raced 80 yards for a touchdown to push the lead to 13-0 with 3:51 remaining in the half. Ontario (2-4, 0-3) was held to two three and outs and an interception in the opening frame. Finally, Todd broke free on a scramble and went 40 yards to set up Ontario’s only touchdown of the first half. He found Ethan Pensante on a fade on the left side for a 17-yard touchdown with 1:06 left in the half to cut the deficit to 13-7. Todd had to be carted off the field with a leg injury with 0:24 left in the game trying to stretch for more yards on a carry. The injury appeared serious and both teams knelt in prayer together after the game concluded. Next, BV continues league play at Marion Pleasant Friday night at 7 p.m.